No GP this weekend - it’s next weekend! However, what did we learn from the Bahrain Grand Prix? Well, the first thing we learned is that the split Qualifying is a complete turn-off for everyone. It does not make you want to sit in front of the TV to see the cars doing single laps on Saturday, and then do it again on Sunday. It is high time the FIA woke up and reverted to 12 laps in one hour on the Saturday, with the fastest man on pole for Sunday. We also learned that there are fast drivers, and there are ‘racers’ and they don’t necessarily go hand in hand. Alonso in the Renault won the race by a comfortable margin, but he wasn’t the fastest driver in Bahrain. That was Pedro de la Rosa in the McLaren-Mercedes, who was three tenths quicker than Alonso, four tenths quicker than his team mate Raikkonen (who came third), and almost one second quicker than Trulli in the Toyota who came second! Fortunately Pedro was there, standing in for Montoya who injured his shoulder playing tennis (though scuttlebutt has it that he fell off his trail bike), as otherwise it would have been a fairly dull grand prix. His attempts at passing which resulted in his falling off the road several times certainly brightened up our day. The next GP is the San Marino on the 24th of April, and I expect Montoya to be back behind the wheel, and Pedro sent back to the test team. The GP will be televised here live at 7 p.m. (I think). By the way, try to get the South African feed via Supersports 2, it is much better than the Star Sports commentary on UBC, and has no adverts, so you do not miss any of the action. I will not be in Thailand for this GP (having fled Songkran), so my seat at Jamieson’s Irish Pub will be vacant. Keep it warm for me till I get back! 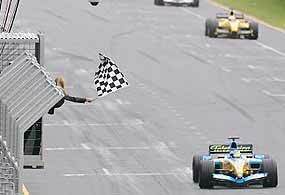 Last week, I asked what was the origin of the chequered flag to signify the end of a motor race? The ‘real’ answer was given to me by one of my motoring mates, Vic Garra, as I had tried last year to get an answer and failed! According to Vic’s research, the Americans claim the origin. I quote, “One flag which is widely used today is the checkered flag. This flag indicates that the racing event is over or concluded. It owes it’s past to the ladies of small mid western towns. These townships would sponsor a horse racing event and would have competitors come from miles around to either race their horses or just watch the festivities. The town’s ladies would cook up huge meals and serve them on the race grounds. It has been written that when the meal was ready to be served, the ladies would start waving a checkered table cloth to indicate to the spectators and racers that the racing was over and it was time to come and eat. The use of the checkered table cloth carried over to when automobiles replaced horses and somewhere along the way, the big meals on the grounds were no longer prepared. But the checkered table cloth remained as the indication that the race is over. It is used extensively today to indicate the Winner and a Champion.” Well, I’ll be goshdarned! Thanks again Vic. So to this week. The Detroit of Asia magazine was released at the Bangkok International Motor Show, celebrating the fact that Thailand is an important auto manufacturing center in Asia. You can’t omit GM when talking about Detroit, so what GM model was assembled here in Bangkok in the early 1970’s? BMW showed many new vehicles at the Bangkok International Motor Show, with the 1 Series, the 3 Series and the updated 7 Series. Also on the stand were the X3 and the X5, and it is this last vehicle that caught the imagination of some of the testers from Australia, who gave the good points as - Performance, grip, handling, exhaust note, six-speed auto, equipment list, safety features, stability, steering, build quality, and exclusivity. Not a bad sort of wrap! What they didn’t like was - Aerodynamics (eh? It has all the aerodynamics of a house brick), no manual transmission, no third-row seating, some gear hunting in the auto mode, and needing premium unleaded fuel. Tim Britten, the tester for GoAuto in Australia, began his report by writing, “This is the sort of car that demands superlatives. BMW reckons so anyway. 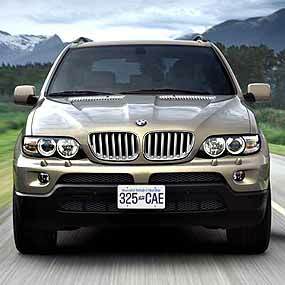 In three brief paragraphs containing a total of 132 words, the X5 4.8is was introduced at the 2004 Sydney motor show using terms like “fire-breathing”, “steroid-enhanced”, “benchmark-setting”, “tarmac-melting” and “driver-thrilling”. That the X5 4.8is is a mighty force among SUVs (sports utility vehicles) there can be no doubt.” Down under, only the Porsche Cayenne Turbo has more grunt and it is more expensive, though in Thailand they are about the same price - around 10 million baht, though what we get is the 4.4 litre version of the X5. Again, GoAuto says it all, mentioning that testing and development of the X5 included time at the famous Nurburgring. “That’s why acceleration times (zero to 100 km/h in 6.1 seconds) are more important than how it goes in the bush. This is an AWD one could use to joust with a sporty V8 sedan. “Its 265 kW are massive enough, but the 500 Nm of torque are even more impressive, exceeding the Nm-per-litre output of just about any other regular, on-road engine. “The X5’s suspension has been re-worked, and there’s a set of new wheels and tyres, larger at the back than at the front, that give the BMW some really workmanlike contact patches on the road. “A bodykit underlines the intentions of BMW’s high-performance team in developing the 4.8is, as it is aimed at improving aerodynamic stability at high speeds. The Cd figure is reasonable for a big AWD at 0.38. “The 4.8 litre gets things like a new engine management program, as well as modified inlet and exhaust systems with a quadrupled array of pipes thrusting out of the rear panels. In addition to providing all that extra power, this ensures an omnipresent, thundering V8 exhaust note. “All the torque and kiloWatts are directed through the familiar six-speed ZF automatic used widely across the range (and by other car-makers). There’s no manual transmission option. With this car (and most BeeEmms) you have to memorize the acronyms! Try Automatic Stability Control and Traction (ASC-X), Dynamic Stability Control (DSC-X), Anti-Lock Brakes (ABS), Dynamic Brake Control (DBC), Automatic Differential Brake (ADB-X), Hill Descent Control (HDC, which helps keep things under control, without driver intervention, on a steep off-road slope), Corner Brake Control (CBC), self levelling suspension and park distance control. In the safety stakes, just in case you do fall off the road, despite the numerous electronic systems to keep you on it, the X5 also gets a five star Euro NCAP crash test safety rating with standard passive safety features including 10 airbags - dual front, four side, and four front and rear headbags. Tim Britten gave the driving side the thumbs up too. 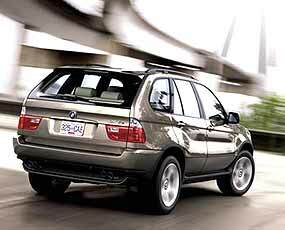 “The driving experience is pretty familiar X5. 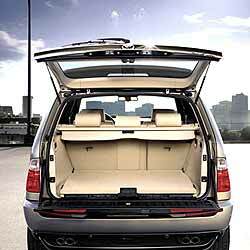 The inside feels quite massive, with plenty of stretch-out space even for beefy passengers. There’s no third row seating, of course, but the load area behind the rear seat is quite spacious and covered with a roll-out blind. “With all-wheel drive (AWD) constantly available via the new infinitely variable xDrive system, there’s always traction to control any wayward kiloWatts, even on slippery surfaces. The xDrive favours the rear wheels, where it can send up to 100 per cent of the power if needs be, but also apportions some of it to the front wheels when necessary. It’s also connected into the electronic stability control, meaning it can juggle the power so it goes to the wheels where it will have most effect in controlling an imminent slide. And the tyres - 275/40 R20 at the front and 315/35 R20 at the rear - are what’s needed for the task, even if they are clearly not intended for even a whiff of off-road work. “The 4.8is feels as quick as virtually anything on the road, which in fact it is. A non-turbo, massive vehicle like this that accelerates like a Subaru WRX is something to be experienced. And, like all X5s, the handling and road grip is something to be experienced as well. The top-heavy feel of just about all 4WDs, soft-road or off-road, is hardly noticeable here, apart from the fact you’re always aware of the elevated seating position. “The BMW, which basically uses 7 Series self-levelling suspension, steers with a sharpness and a sense of agility that it rare in this segment. Only the Porsche Cayenne shares the BMW’s sense of stable, high-speed security. The ride is firm, but quite comfortable, making the 4.8is feel quite regal on the road, pretty silent on a country cruise where the sight of an appealing back road is sure to entice, remembering always that the tyres may not like too much sharp-edged stuff. “It’s all a quite thirsty business though. Our test car averaged around 14.4 litres per 100km on test, which admittedly isn’t bad considering the weight, size and power of this vehicle but would have been worse had we covered more urban kilometres. At least it is offset by a decent size, 93 litre fuel tank. Premium grade unleaded is a prerequisite, however. “The six-speed auto, as in the 7 Series, is a smooth shifter with plenty of ratio options to choose from although, surprisingly, it will hunt through the gears at times when left in drive mode. The sequential pattern is standard BMW (forward to downshift, back to upshift) but non-standard compared to just about everyone else. Will we get the 4.8 litre version here? I somehow doubt it, but the 4.4 isn’t a poor relative in any way either!